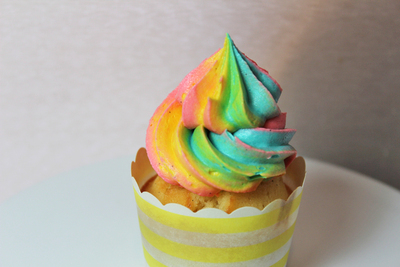 This is a neat effect that can be used to make any combination of rainbow or multicoloured icing. Get your piping bag ready. You'll need a reasonably large piping bag and tip. 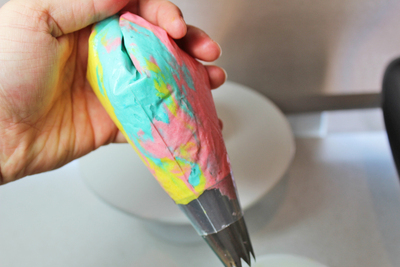 The 16MM Wilton star tip is a good choice for swirl icing. Place the tip inside the bag and snip the bottom so the tip pokes through. 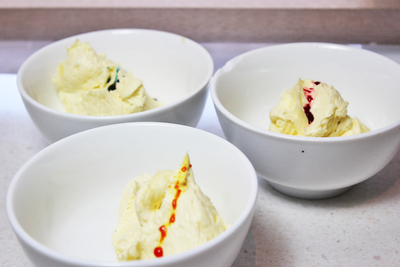 Split your icing into three separate bowls. 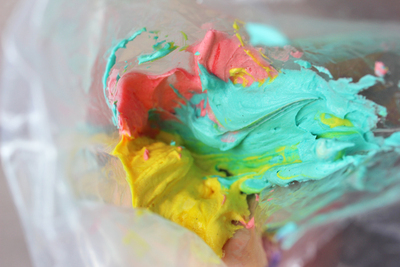 If you're using more or less colours, split your icing into the number you're using. 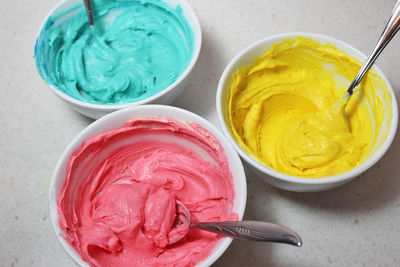 Add the different colours to each bowl. 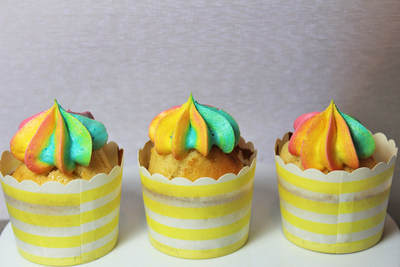 Mix the colours well using individual teaspoons. 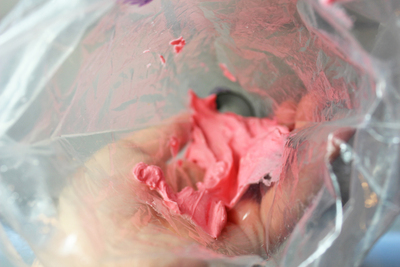 Use a small silicone spatula to place your first colour inside the bag. Keep the colour to just one side of the bag. You need to fit all your colours along the outside of the bag. Continue with your second colour. Placing it on another side of the bag so that it touches the first colour. Try and make sure all colours start at the same point near the tip. It can get a little bit messy as you fill up the bag. 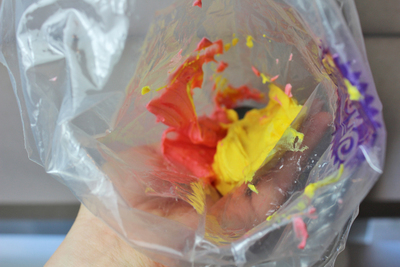 All colours should be touching along the outside of the bag. Press the icing down evenly to remove any air pockets. Twist the top end of the bag tightly. 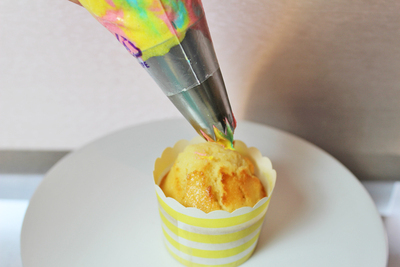 Start by piping in the centre of the cupcake. 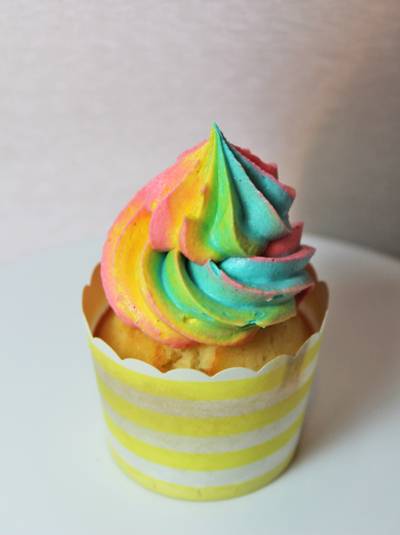 In one motion swirl the icing around the cupcake as if you were drawing a spiral. Alternatively, just pipe a small star onto each of the cupcakes.